adidas Originals is continuing to add to their “Glitch Camo” series by releasing an all-new adidas NMD R1 Primeknit for November. Dressed in a Core Black and Grey Three color scheme. 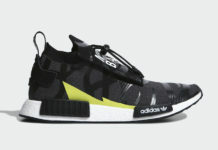 This adidas NMD features a full Primeknit upper with its signature sock-like collar covered in a “Glitch Camo” pattern. A White Boost midsole and Black rubber outsole completes the design. Look for this adidas NMD R1 Primeknit “Glitch Camo” in Black/Grey to release early November at select adidas Originals retailers. The retail price tag is set at $170 USD.